CyberpowerPC (www.cyberpowerpc.com) is taking no prisoners to close out the year. The company today announced the third generation of its Fang desktop gaming PC series – a meaner, faster, bolder way to experience immersive high definition gaming. The Fang III series, which consists of the Rattler, Viper, Cobra, and top-of-the-line Black Mamba, have been re-armed with an arsenal of powerful new features to conquer all the latest games and give you the performance to dominate your opponents. Speed is the key and the Fang III have all been retooled with new 2nd Generation Intel Extreme Core I processors; the latest Intel Chipsets that support blazing fast dual channel and quad channel memory; PCIe 3.0 motherboard support; CyberpowerPC’s Advanced hydro liquid cooling matched with feature-rich gaming cases, and an injection of Venom Boost overclocking. CyberpowerPC’s Fang III gaming PCs ranges from smart and efficient dual core CPUs to the massive hexa-core extreme edition to provide blistering performance and power. Users can enhance their Fang III systems with CyberpowerPC’s Venom Boost technology which overclocks the processor up to an additional 30 percent to torch your opponents without frying your system. Venom Boost technology is a safe way to obtain maximum performance for gaming, multi-tasking and intense multimedia and business applications. CyberpowerPC pairs every Fang III gaming rig with the most current video cards from NVIDIA and AMD to deliver cinematic visuals on the latest games. Combined with the power of Multi-GPU technology, which includes NVIDIA’s SLI and AMD’s CrossFireX, gamers get all the graphics horsepower needed to drive multiple monitors. The Fang III series also lets you enter your game with NVIDIA’s immersive 3D Vision technology. The Fang III series can also be configured with NVIDIA 3D Vision in surround mode, which streams graphics across three HD displays. Every Fang III features CyberpowerPC’s Advance Hydro Liquid Cooling Kit to keep your Venom Boosted CPU and extreme gaming GPU cooled and running quiet. The Fang III introduces a new cooling option for the Black Mamba and Cobra gaming systems, a new 480mm Advanced Hydro liquid cooling kit has been implemented for maximum heat dissipation. All Fang III systems are housed in a gaming chassis designed to be feature rich and provide “visual candy” from top-tier chassis manufacturers. The Black Mamba and the Cobra have been refitted with the new Azza Fusion 4000 gaming chassis, a revolutionary super tower with its ability to hold two systems in a single structure. CyberpowerPC’s OC Media Server Station acts as that second independent system. It can be installed on top of the Black Mamba or Cobra gaming rigs. The OC Media Server Station can serve as a real time monitoring and tweaking machine in addition to a home server system dishing out and storing your digital media. The Black Mamba is CyberpowerPC’s top-of-the line gaming rig. Performance is maxed with its 2nd Generation Intel Core i7 Extreme Edition processor that is overclocked an additional 30% with CyberpowerPC’s Venom Boost technology and cooled by its Advanced Hydro Liquid Cooling Kit. A set of liquid cooled NVIDIA GTX 590 video cards in Quad-SLI mode provide a flawless and smooth gaming and multimedia experience. Other standard features include 16GB DDR3 quad channel memory; 2TB HDD; a pair of OCZ 120GB SSD (solid state drives); HI-Def 7.1 audio; LG 12X Blu-Ray rewriter; and Razer Lycosa gaming keyboard and matching Razer Lachesis gaming mouse. Base price is $4999. The CyberpowerPC FANG III, like all models in the series will leave your foes snake bit with its 2nd Generation Intel Core i7 processor that has been Venom Boosted 20%. The CPU is paired with a NVIDIA GTX 570 graphics card; 16GBs DDR3 quad channel memory; 1TB HDD; Blu-Ray combo drive; liquid cooling; and AZZA Fusion 400 chassis. Base price starts under $1999. The Viper can beat any competitor’s price-point without skimping on performance. It features a powerful 2nd Generation Core i7-2600K processor that has been overclocked 10%; DirectX 11-ready AMD ATI Radeon HD 6870 graphics for smooth Hi-Def gaming; 8GBs memory; 2TB HDD; water cooling and Blu-Ray combo drive. Base price is $1249. The newest member to the Fang Series has been completely retooled with a new Intel 2nd Generation Core i7 processor that get a 10% Venom Boost; DirectX 11-ready AMD ATI Radeon 6850 graphics for superb gaming and multimedia performance; 8GBs memory; 1TB SATA II hard drive; 24X DVDRW and Asetek 240MM water cooling. According to CyberpowerPC, the coolest feature may be the base price at under $999. The entire Fang III series is assembled in the US. Every system is meticulously built including precise cable routing to ensure optimal airflow and a clean aesthetic appearance. CyberpowerPC loads every system with Microsoft Windows 7 Home Premium Operating System for an enhanced gaming and multimedia experience. 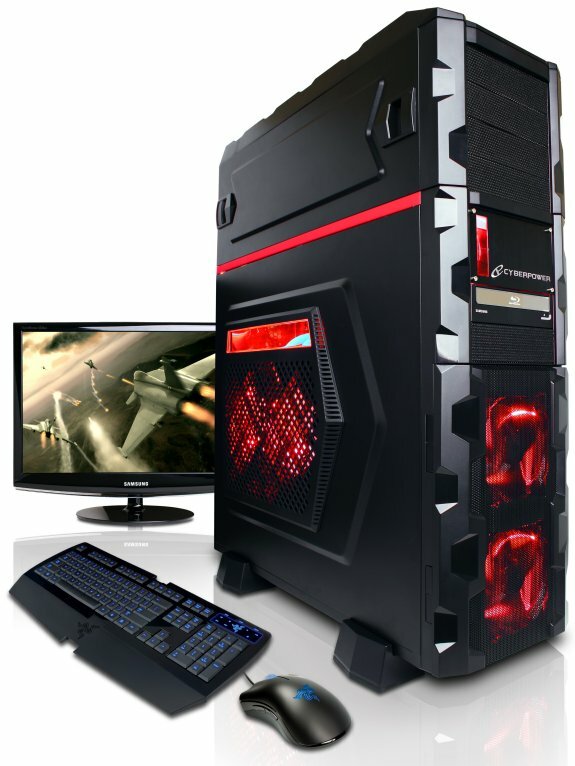 All CyberpowerPC Fang III gaming systems include a 3-year limited warranty and free lifetime phone support.